In a Nutshell: UserVoice simplifies product management by automating the collection of customer feedback and turning it into actionable data that can be used to drive strategic product decisions. The software platform gathers meaningful customer input through multiple channels, such as widgets, customer portals, and mobile applications, and routes that information into a single location where it can be easily managed, analyzed, and acted upon. By enriching feedback with quantitative data, product teams can prioritize feature development based on statistical analysis of customer traits and preferences, rather than solely relying on intuition and guesswork. With this information, product teams can feel confident that every new feature developers are working on will be a hit with customers. These days retailers are able to connect and interact with customers like never before. And customers now expect companies to not only listen to their feedback but to actually use it to improve their favorite products. In fact, a MarketingLand survey found that more than half of customers will defect if they perceive their feedback is ignored. Given this, it’s critical that product management teams are able to efficiently collect and respond to customer suggestions. Moreover, they must also be able to use that data to actually drive development strategies that will provide customers with the features they value most. 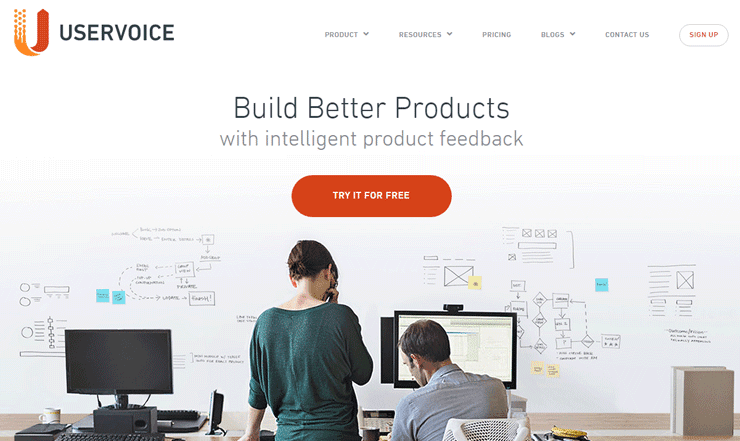 Launched in San Francisco in 2008, UserVoice offers product feedback management software that transforms the way businesses gather, organize, and analyze customer input. Instead of relying on intuition and guesswork, UserVoice makes data a foundational part of strategic product decisions. UserVoice gives product management teams software to collect and analyze data based on customer feedback. Customer feedback typically travels through a mishmash of different channels — emails, online forums, website comments, social media — and gathering and organizing all of this information can be a monumental undertaking. And that’s just the start. Product managers must also have a system in place to make sense of the data, so it’s meaningful and actionable enough to facilitate development. UserVoice’s unique software platform automates the collection of feedback and enriches it with quantitative customer data, so it can be used to prioritize feature requests to keep customers happy. When it comes to collecting feedback, product managers often face a deluge of data from many different sources. Whether they receive suggestions directly from users or from internal customer-facing teams like sales and support, collecting and managing all of those details can be a nightmare unless they have an efficient system for handling such a massive amount of information. Rather than tediously pulling customer feedback from a disconnected array of emails, lists, and spreadsheets, UserVoice collects and stores it all in one centralized location. The software platform not only makes it easier for customers to share feedback, but it also captures their input in a format that’s easy for product teams to manage and analyze. UserVoice provides retailers with multiple tools for gathering feedback directly from customers and routes that data into a single, comprehensive database. 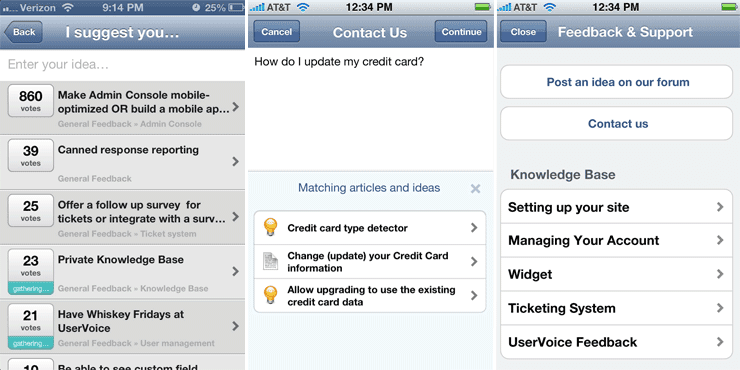 Companies can solicit and capture customer input using three different channels: widgets, web portals, and mobile apps. Each of these channels directly engage users through easy-to-use technology, enabling them to leave their ideas and suggestions in a location they know companies are closely monitoring. Widgets let retailers connect with customers while they’re browsing a company’s website without taking them out of their experience. UserVoice offers several different widget applications: Contact Form widgets allow customers to send messages directly to product managers and customer support; SmartVote widgets enable customers to vote on potential product ideas presented by the company; and Satisfaction widgets give customers a chance to rate a business based on how likely they would recommend it to others. The UserVoice web portal provides a dedicated space on a company’s website where users can post their reviews and educate themselves about its products. For instance, the portal’s Feedback Forums let customers comment on existing topics or create their own suggestions, while the portal’s Knowledge Base section offers them access to a collection of articles and blogs, where they can find answers to any questions they have about a business’ offerings. And if they don’t see what they’re looking for in the forums or Knowledge Base, customers can use contact support forms within the portal to submit tickets directly to product and support teams. And if the forums or Knowledge Base don’t answer their queries, customers can use contact support forms within the portal to submit tickets directly to product and support teams. While both the web portal and widgets embedded in a company’s website are fully optimized to work on mobile browsers, UserVoice also offers SDKs, or software development kits, for iOS and Android so retailers can build feedback features directly into their apps. This functionality allows companies to control and customize how they gather customer comments in the mobile environment. Whether it’s through widgets, forums, contact forms, or other features, the UserVoice mobile channel provides customers with a seamless feedback experience from wherever they happen to be. 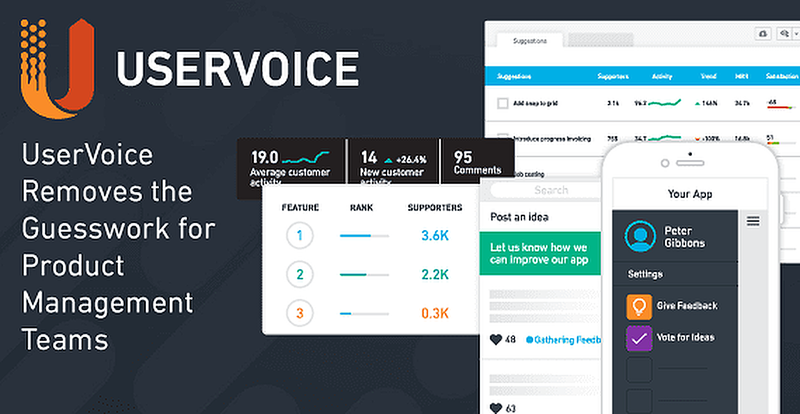 UserVoice allows retailers to build customer feedback functionality into their mobile apps. It’s vital that customers are not only able to easily provide feedback, but also know that their input is being heard and acted upon. To this end, UserVoice offers an array of tools so retailers can communicate with their customers about the status of their suggestions. The platform allows companies to automatically update supporters of an idea as it moves through different stages of product enhancement from discovery and planning to development and launch. This lets users know you’re listening to their suggestions and makes them feel included in your product’s lifecycle, so they’ll be more likely to continue providing feedback. It also allows you to drive new feature adoption by keeping the most interested customers in the loop as you roll out new capabilities. Collecting customer input is only part of the equation. The feedback must also be efficiently organized so product managers can use the data to gain insights into exactly what customers want and then take action. UserVoice enables them to quickly manage feedback using labels, filters, and other tools, so it takes less time to review and make sense of the information that’s been collected. Labels allow for feedback data to be categorized and tagged for better organization. With labels, product managers can quickly navigate or save views of customer suggestions to understand common themes. Labels can be also used to categorize potential features by specific qualities, such as strategic value or estimated cost of development, for improved prioritization. Feedback can be further organized with filters. Product teams can focus on the most relevant and valuable input by creating filters that customize views and reports for just the data they want to see. UserVoice facilitates data management for product managers in several other ways, including giving them the ability to create custom categories for forums and offering them quick solutions for editing and streamlining large volumes of data. What’s more, the software also frees up their time by allowing customers to organize their own product ideas and moderate feedback content. Once feedback has been collected and organized, UserVoice’s analytics tools allow for the data to be thoroughly examined and ranked. Product managers are then able to determine which ideas should be acted upon and in what order they should be launched. With the ability to segment feedback using customer traits, such as user type, plan, spending, and satisfaction score, UserVoice lets companies quantify the data to keep product development focused on the ideas that have the most significance and value. The software also provides tools for easy trend reporting, so teams can quickly see what ideas currently have the highest levels of customer support and whether desire for the new features has increased or decreased over time. Once the potential feature ideas have been narrowed down to a manageable number, A/B testing of the ideas can be performed using UserVoice’s SmartVote polls to determine which ones customers want most — and then the results of those tests can be used to prioritize new feature rollout. Taking the emotion and ambiguity out of product management, UserVoice allows teams to make decisions based on hard data rather than intuition. At the same time, it deeply engages customers by inviting them to become a key part of the company’s product development process. This lets them know you’re not only listening to what they have to say, but you’re actually using their ideas to enhance the goods and services they’re purchasing. Having a product roadmap that’s driven by advice from your most important stakeholder — the customer — will ultimately lead to better products, happier customers, and increased revenue. And that’s a blueprint for success that couldn’t get any clearer.